This medical supplies company is “Minority/Women-Owned Business Enterprise Certified” & they provide a wide variety of medical supplies, including products for people with difficulty swallowing (dysphagia). CWI Medical provided SwallowStudy.com with a coupon code to pass discounts on to you! Click on coupon. Financial Disclosure: SwallowStudy.com receives a very small percentage of the sale. Click on coupon for your dysphagia medical supplies & more. Use CODE: SWSTY5 to support SwallowStudy.com with every purchase. Thank you. I have been impressed by this medical supplies company, CWI Medical, out of New York. Not only are they Minority/Women-Owned Business Enterprise Certified, but they also provide convenient home delivery of medical supplies. Particularly helpful to people with dysphagia, CWI provides: thickener powders and gels (in the preferred gum-based thickeners), pre-thickened liquids, protein shakes and nutritional supplements, pureed meals, and more. Nutrition, Incontinence, Mobility and Ambulatory, Daily Living Aides, Personal Hygiene, First Aid, Bathroom Safety, Braces and Supports, Home Diagnostics, Patient Room and Homecare, Drug Screening Tests, Bariatric Care, Babies and Kids, Samples, Healthy and Helpful Gifts, and even Halloween Props (seasonally)! CWI is responsive to calls and emails, and their website is easy to navigate. My partnership with them will provide ongoing access to reliable coupons and discounts on medical supplies for people with difficulty swallowing. I receive a very small commission on every purchase. Product review of Thickened Liquids. Thickened Liquids post – for even more information. 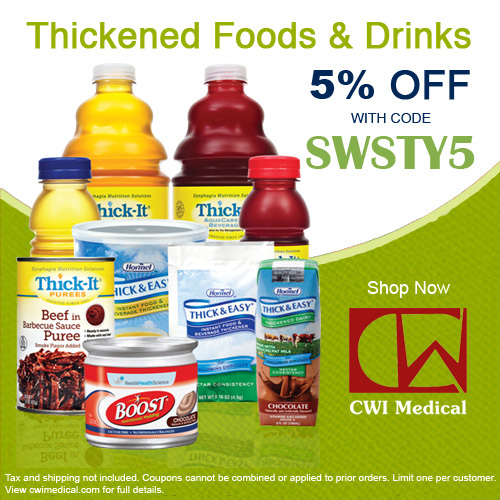 Use this coupon code for 5% off medical supplies for your loved one with dysphagia (difficulty swallowing).